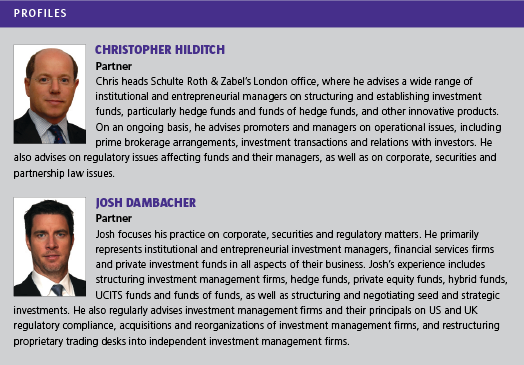 The London office of Schulte Roth & Zabel has been operating for 11 years now, making the firm one of the few that can claim to have a significant presence on both sides of the Atlantic and the only firm ranked in the top tier in both markets. Their capability in offering expertise in New York and London concurrently has been a strong selling point, making for a compelling offering to the hedge fund sector. Over the past year, SRZ has seen a steady 50:50 ratio of new fund launches to launches for existing clients, with volumes in their business pretty constant, although some prime brokers are of the opinion that overall volumes are diminishing. Nevertheless, SRZ expect that the market will carry on at a good rate. Christopher Hilditch, a partner and head of the London office, foresees “a good pipeline” of new fund launches to come. There is still a great variation in the types of strategies and size of these new funds, from the small boutique to the large powerhouse groups. One trend which has been emerging recently is large opening investments for start-ups. There have been cases of SRZ clients receiving cornerstone investments of more than $100 million to get a fund up and running. These investments have mainly been from the US, the traditional stronghold of the hedge fund investor community. While problems continue in Europe, there is definitely, some might say surprisingly, demand from America. For existing clients a big chunk of the work over the past year has been around tailoring their clients’ offering to meet investor requirements. SRZ has found itself increasingly restructuring funds to facilitate investment by ERISA investors. ERISA sets fiduciary standards for pension funds, and if a hedge fund falls under its ambit, particularly in its 25% limit on investment by a pension fund in one asset classof a hedge fund, then it may have to meet different and more demanding disclosure requirements. Managed accounts entail a considerable amount of legal negotiation and operational infrastructure, so it can be a delicate balance between accommodating the needs of the investor and doing what is in the best interest of the fund and the manager’s other clients. The ability to negotiate that balancing act, as well as doing the legal leg-work, is something SRZ prides itself on. Another big source of that leg-work for the hedge fund industry is the AIFMD. The directive is seen by some as a threat, but SRZ does not share this fear, although it has committed significant resources to working through the myriad complexities of the regulation. There will certainly be obstacles to overcome. AIFMD will change how the relationship with the administrator works, and there are also depositary issues to be overcome. These will be problematic at first, but, from SRZ’s point of view, once the best and most efficient way to comply is found, the method will spread quickly throughout the industry and will become the norm. The AIFMD has been designed to regulate the alternative funds industry while also offering the incentive of the much vaunted passport, allowing funds to market throughout the EU with one standardised regime. This is meant to be seen as compensation for the increased regulatory burden. The passport may allow managers to market broadly without having to resort to the UCITS regime. UCITS allows managers to market to the retail sector while offering protections for investors, but the reality, as SRZ sees it, is that very few hedge funds really have the ability to use UCITS properly. In the US, registered fund structures superficially similar to UCITS are actually on the increase. Trends in the American market are often repeated here, but, in this case, it is actually a quirk in tax law, not regulatory pressures, which is causing the movement. This does not mean that AIFMD heralds the end of UCITS products, but it does mean that when a manager goes for it, they will really have to commit. Indeed, it may be that for those who have the brand and the capability and who can operate within the restrictions of the UCITS regime, UCITS will be a more attractive prospect. With all of these disparate problems and idiosyncrasies, it is going to be increasingly important for managers to examine their offering, and to know exactly what they need, and who they are going to target. The increased costs associated with compliance with multiple sets of rules mean that it really does make sense to think long and hard about methods to find what is right for the fund. SRZ’s business model is predicated on mirroring that need for flexibility. Any good business should be based on client demand first and foremost. SRZ are confident that they are well positioned to meet client demand with their expertise in New York and London. They believe that their premier Transatlantic offering will keep them at the top of the market for hedge fund legal advice. A measure of the importance of their ability to offer advice across the two biggest hedge fund markets is the fact that all of the lawyers in London receive much of the same training in US issues as those in New York. This means that they are alert to any problems to which London managers might be exposed. They can then work with specialists in London or New York to solve problems particular to that jurisdiction. While SRZ does not pretend to be able to predict every twist and turn of the latest wave of regulation which has been steadily coming since 2008, it is confident that it has the ability to actually add to their clients’ businesses, guiding them as to what is bestfor their fund.